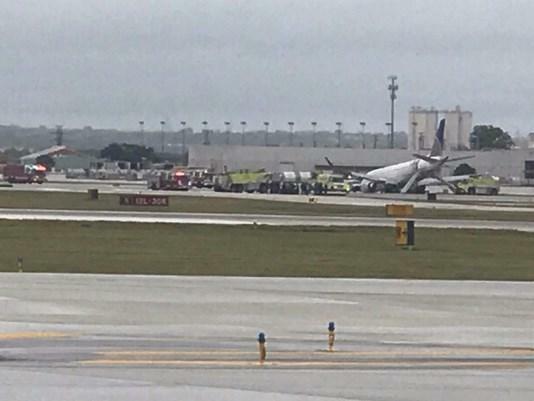 SAN ANTONIO - Authorities say everyone was safely evacuated from a United Express plane after its nose gear collapsed when it landed at San Antonio International Airport. San Antonio Fire Department spokesman Woody Woodward says that when the plane landed Sunday afternoon its nose gear collapsed. He says 55 people were safely evacuated from the plane via emergency slides. He says there was no fire. CBS San Antonio affiliate KENS-TV reports that all 51 passengers and four crew members safely exited the plane. There was one minor injury to an ankle, but the person refused treatment because she was concerned about making her connecting flight. Skywest Airlines said Skywest Flight 5588 operating as United Express from Houston to Monterrey, Mexico, diverted to San Antonio after the crew got a gear indication. The crew of the the Embraer-manufactured E175 had to circle the flight tower before landing safely.